During his introduction to a slightly more in-depth demo than the one that opened the PlayStation conference, director Cory Barlog spoke at length about the changes that have come to God Of War. It looks different. It plays different. It’s set in a different part of the world. While he’s definitely a changed man, Kratos himself is perhaps the only thing that hasn’t been completely rewritten. For one, this is the same Kratos players know and love—or loathe, more likely. Following God Of War III, Barlog said, Kratos finally accepted the fact that he will never be able to die and thereby release himself from all the anguish the gods put him through. So he wanders Europe in search of a place where he can separate himself from the world and make a fresh start. After an unspecified amount of time (a period Barlog implies will be explored in this game and possibly future sequels), he settles in Scandanavia during an era before the Vikings, when the Norse gods still walk the earth. 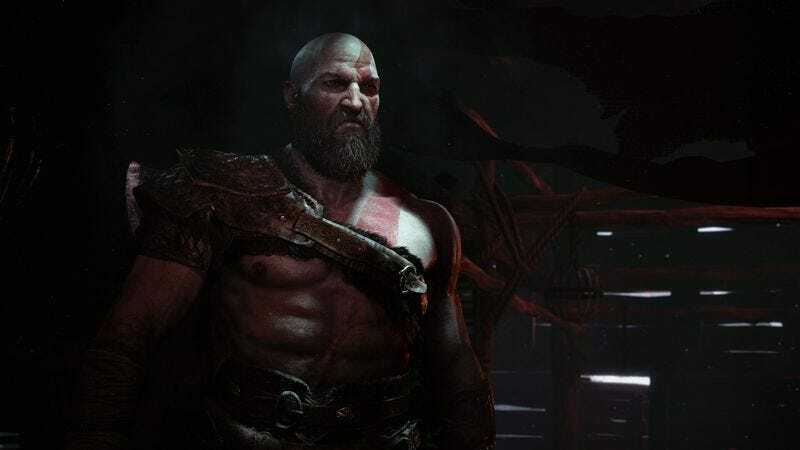 He meets a lady—who was conspicuously absent from this demo and whose situation will be a large part of the game’s story, Barlog said—and has a son, who, like Kratos, is a demigod. But instead of continuing the cycle of father-son violence that underscores Greek mythology, and that Kratos himself was a part of, the former God Of War attempts to change his ways, bury his ceaseless fury, and raise this kid properly. That father-son relationship is the crux of the game, with Kratos’ son accompanying him throughout the adventure. An experience point system tracks the kid’s knowledge as you impart fatherly lessons about all the stuff a warrior god needs to know. And he’s not just dead weight. At the push of a button, Kratos calls upon his son for an assist in battle—slowing down or distracting his enemies. What we’ve seen of his parenting skills so far has been unsurprisingly icy and demanding, with the occasional hint of the old angry Kratos peeking through his attempts at suppression, but the idea is we’ll see their bond strengthen over time, perhaps even deigning to pat his kid on the back during a tumultuous moment rather than stopping halfway as we see in the demo. Fatherhood is well-trod thematic territory, but any devotion to an emotional range that pushes beyond violent angst is a welcome and commendable change for the series. The two-man team behind Thumper is crafting a different kind of music game. Both Marc Flury and Brian Gibson (best known for being the bassist from legendary noise-rock duo Lightning Bolt) are former Harmonix employees who worked on that company’s rock-star fantasy fulfillment games in one form or another. But Gibson thought there was room to do something more with the way players interact with music—something that’s a truer representation of his emotional connection to music and performance. Thus the writhing sonic hellscape of Thumper was born. There’s a clear tonal parallel between Gibson’s music and the game. Lightning Bolt is known for two things: the ear-crushing intensity of its music and the energy of its live shows. The band typically plays on the floor, both the catalyst and conduit for the surrounding crowd’s energy. In those moments, Gibson explains, it becomes less about mindful performance than melting away into the energy and music. That’s the feeling Thumper aims to evoke, where the music itself—created by Gibson, of course—is alive and all encompassing. Unlike Rock Band or even more abstract rhythm games such as Amplitude, you’re not really performing the music so much as surviving it. You control a metallic “space beetle” as it flies down a living, mutating highway in a tunnel of harsh psychedelic visuals. The action plays out like a dangerous call and response, with the music’s various elements laying down obstacles you’ll have to push through, often challenging you to enter a specific set of simple button presses in quick succession and with little warning. Throughout its lengthy stages, you’re doing battle with the pounding, percussive music. Sometimes that fight gets a little more literal, as you’ll have to land certain button presses to send orbs flying at killer triangles or, in the case of the boss at the end of my demo, a giant flaming skull. Even without virtual reality and with the noise of the show floor seeping beyond my headphones, Thumper’s journey into the heart of music was probably the most violent and entrancing thing I played all week. Ten minutes of Titanfall 2 multiplayer was enough to remind me why the original was such a refreshing treat. The ideas it brought to first-person shooters—particularly a rethinking of how they handled mobility and verticality—seeped into its peers almost instantly, but no one does it better. When you’re not stomping around in a powerful mech, you’re swooping around its big, open arenas as a nimble pilot, capable of running on walls, clambering up ledges, and getting a little midair boost from an unseen jetpack. The amount of maneuverability you’re afforded is empowering, bringing with it a new kind of parkour-like creative freedom amid the chaos of human-on-human-on-robot-on-giant-robot war. Titanfall 2 adds a grappling hook to its bag of tricks—for one character class, at least. It doesn’t so much override all the sprinting and climbing as it gives you another tool for creative movement or escapes. It works more like Spider-Man’s web-slinging than Batman’s shoot-and-reel grapnel, allowing you to swing and maintain momentum as it reels in. It’s a perfect out for those moments when you round a corner and come face-to-face with a mech or if you’re looking for an unexpected way to reach higher ground. The Titans have gotten a bit of an overhaul as well. You’re not able to mix and match the weapons your mech comes equipped with, as Titans are now locked down classes with several specific abilities each, but they appear to have been retooled to better deal with the pilots’ mobility. I had found success with Scorch, a mech that rains lingering fire down on its enemies. Where there used to be a timer that was always counting down to your next available mech deployment, Titanfall 2 makes you earn those drops by taking down enemy players and AI. While this has the potential to put a damper on the morale of players who can’t find their groove, the opportunity to summon a massive flame-shooting robot suit is definitely a satisfying reward for stringing together a few successful plays. I actually played Inside—the entirety of Inside—before leaving for E3. While I’ll be writing a proper review in due time, it’s definitely a game that’s worth calling out here and one that I think the Gameological community will be talking about for a long time. This is the second game from Playdead, the studio behind the iconic monochromatic platformer Limbo. It’s very much an extension of everything that fueled the company’s debut—unflinching mood, brutal silences dashed by powerful noise, fleeting moments of shocking violence, and simple environmental puzzles. In the opening minutes, it evolves two of Limbo’s most haunting tricks. First there’s the sight of strangers in the distance. They’re clearly nefarious, but you’re far enough away to be out of danger. Unlike Limbo, where the others linger in the background and try to hit you with deadly traps, that distance doesn’t last. In Inside, they come directly for you, and the feeling of being pursued—by people, dogs, and other unspeakable things—is nerve-wracking, more so than the horror Limbo creates when that giant spider gives chase. 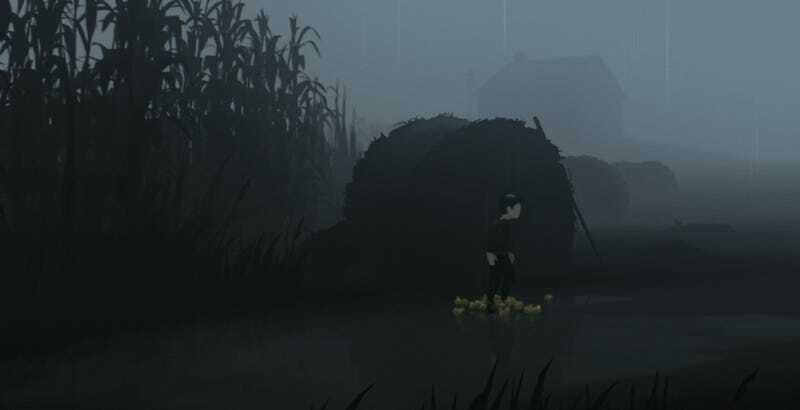 In fact, Inside really does lean into the horror aspect of Playdead’s expertise. On more than one occasion, I found myself yelping and pleading with my little avatar to pick up the goddamn pace. There are calmer respites between those bouts of terrible tension, where the action slows down for a more elaborate puzzle or scene, but they never last long. We’ll be talking plenty more about Inside closer to its June 29 release date. Horizon continues to be one of Sony’s most touted games, and with good reason. Unlike the newly debuted Days Gone, the umpteenth open-world “craft stuff and murder zombies” game, at least Horizon provides an intriguing backdrop for its craft-and-kill action. It takes place on a “post-post-apocalyptic” Earth, where what’s left of humanity has reverted to tribal hunting-and-gathering societies and nature has long since grown over the remnants of our past world. But somewhere along the line, the wilderness became the dominion of complex robots that look and act like wild animals and dinosaurs—except they come equipped with the occasional rocket launcher and force field. What happened to humanity and how these machines came to be are just a couple of the mysteries that will unfold as players maneuver through this dangerous world. The futuristic hunting-and-gathering premise brings with it a limited arsenal of high-tech old-world weaponry—bows and rope guns built from the remains of fallen robots. Their utility really is in hunting, which you’ll have to partake in to gather resources for trading and crafting purposes. When combined with the animalistic behaviors of the machines, your weapons make for a versatile neo-nomadic-human sandbox. You can track the machines as they go about their lives, studying their routines to lay down traps and inform your plans. Skittish robo-deer “graze” in herds and flee at the first sign of trouble (you). Raptor-like Watchers stand guard for more docile creatures and must be avoided or taken down before you can make a move for their buddies. It’s not all murder and picking for parts. You can forcibly override a bot’s behaviors so it becomes a rideable friend. (Actually, that might be less humane.) There’s a lot of flexibility in how your weapons interact with the world and the machines’ behaviors, and the game is at its best when you’re freely playing around in that space and trying new things. The machines are the real stars here. Their imaginative forms, all pipe and wire and bits of plating, are intricately envisioned and believably animated. I always felt a little bad about using my ropes to pull down the bulky elk-like robots, as you can see the force of the tether strain their bodies and their legs gruesomely flail while they topple over. I didn’t get much sense of Horizon’s human characters during my time with the game, but there is an interesting thematic undercurrent threatening to pull Aloy, the player’s character, away from the rest of her people. She prefers to deal in logic and science while most of her tribe fall back on faith and myth in the face of worsening dangers. That conflict of ideals was prevalent in the footage I saw but didn’t manifest in anything substantial. I’m interested to see if it’ll play more of a role in the rest of the game.